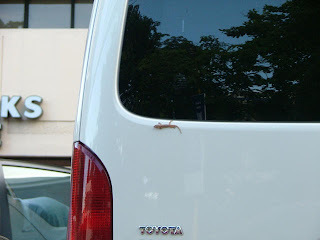 I saw this lizard at the back of a van parked at one of the several Starbucks branches in Makati. It's a real lizard, not those made out of rubber and stuck on cars to fool people. This lizard actually thinks it's stuck to a wall. I remember years back, a baby lizard thought I was a wall since I was standing vertically near it. And being the inexperienced lizard, it didn't know any better and ran towards me and clung on for its life. Well this lizard has more clinging on to do if it wants to stay alive. Once that van starts a-rollin', the poor lizard is gonna start a-freakin' out. I visualize it as a high speed car chase movie scene with the star hanging on the car roof while the car sways left and right. And if it's gonna be on the highway with speeding cars, the car behind may either have a huge splat the window wiper can't remove or instant roadkill and be as flat as the road concrete. Okey, that's the sadistic side of me talking I think. Either way, this lizard is going places. Bonjour !